The first Opium War between China and Great Britain (1839-42) was a humiliating defeat for China’s Qing (Tsing) Dynasty. Its armies, with overwhelming numerical superiority, had unwittingly marched into the maw of Western military science and technology. 1,000 miles to the East, Japanese war lords took note. It was clear to them that very soon Japan would once again find the West on its doorstep. The first verifiable contact between Japan and the West occurred after a disabled Portuguese ship was forced to land on Tanegashima Island in 1543.1 The Portuguese are remembered, among other things, for introducing to Japan, firearms, castle fortification, tobacco, Christianity and syphilis. Western music arrived in 1551 when flutes and oboes accompanied the landing of Portuguese Jesuit missionaries. By 1580, 200 Catholic churches existed in Western Japan and the lute, diatonic harp, viola de arco, clavichord and organs of various types were present by the end of the century. In 1592-93, Dominican and Franciscan friars arrived. Their aggressive proselytizing dramatically altered the temper of Japanese authorities, as well as antagonizing the Jesuits. By 1640, Christianity was outlawed, its adherents banished or killed, its churches closed, and foreign travel by Japanese nationals banned. Japan drew its curtain of isolation against the West. In 1855, a Dutch frigate captain submitted to Japanese administrators a detailed plan for the organization of their navy. The plan required one drummer (taiko-kata) for each warship. His duties were to beat Reveille (okoshi-taiko or “wake up drum” in Japanese), Roffel (Dutch for roll), for raising and lowering of the flag, Appèl 4 for the lowering of the top mast’s spar and Taptoe, (Tattoo in the English Camp Duty) recalling enlisted men to their quarters. In 1864, two Shogunate retainers were sent to Nagasaki with express orders to learn Dutch military music, and, upon their return to Edo, they were charged with teaching that music to students. In 1865, Hosō Shinshiki furoku (“The Infantry’s New Style Training Manual”) was written by Inukai Kiyonobu. 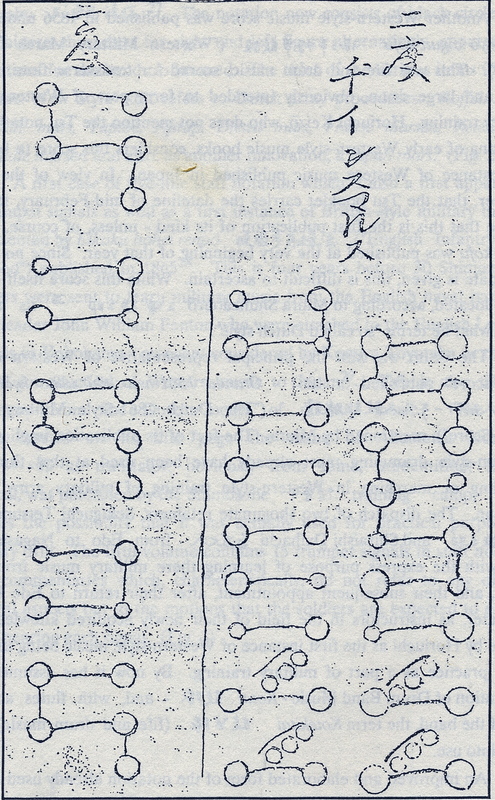 His notation is similar to Taiko-fu, above, but appears more explicit. It also contains Chinese characters for Right and Left, evidently indicating the right and left hands. The signals are still of Dutch army origin: Roffel, Appèl, General mars, Taptoe, Aftrap,6 Dienst7 mars, Franse marsen, Kolonial mars, and interestingly, a Japan mars. A mnemonic system was devised as an aid to memorizing the new music – hihiyāra dondokodon hihiyāra hiyāra dondoko dondokodokodon hihiyāra hiyāra. Western snare drummers will immediately understand the idea, if not the words, as being similar to their traditional onomatopoeia – Paradiddle, Ratamacue, Flam and Ruff – words coined to enable young drummers to memorize the component parts of a drum beat. The first appearance in Japan of five line staff notation, trumpet music, and the influence of British military music, was the trumpet calls in Eikoku hohei renpō, (“English Infantry Drill Method”) of 1865. Four years later (1869), thirty Japanese soldiers of the Shimazu clan were sent to Yokohama to study English military music with John William Fenton, leader of the English Naval Band attached to the English Legation Guards. This was the first departure from the Dutch model of military music. Japan’s official policy seemed to embrace rather than exclude foreign ideas. Besides understanding the futility of confronting Western military power, there were compelling social, economic and traditional governance issues behind restoring the Emperor and looking outward. But as noted above, these had begun internally, well before the arrival of United States war ships. In 1875 an aristocratic ministry official and former fife and drum band leader, Shuji Izawa (1851-1917) was sent to Boston, Massachusetts to study American pedagogic methods under The Boston Music School director Luther Whiting Mason (1828-96) – no relation to pioneering American composer Lowell Mason (1792-1872).8 Upon his return to Japan, Izawa’s report was studied by a committee that eventually recommended officially adopting the teaching of Western music in Japanese schools. Thus, to the consternation of many nationals, Japan became the first and only country to do so in the far East. The tradition of Fife and Drum Corps in Japan (Kotekitai) began in the pre-Meiji era and survives today in various guises, mostly as Drum and Bugle Corps in the style of Drum Corps International. It is a pity that no one alive knows how to play the old drum beats. It would be exciting to hear how the Dutch beats were altered, if at all, to suit Japanese needs and fancies. 1. The information on the beginnings of Western Music in Japan is taken almost exclusively from Southern Barbarian Music in Japan, an essay by Professor emretus David Waterhouse, written for Portugal and the World, the Encounter of Culture in Music, Publicacoes Dom Quixote, Lisboa, 1997. 2. A history of the comings and goings of foreigners during Japan’s ‘isolation’ is beyond the scope of this article, but official policy was malleable: from 1797 to 1809, several American ships traded in Nagasaki under the Dutch flag. The Dutch requested this as their ships could not be sent due to the Napoleonic Wars. 3. 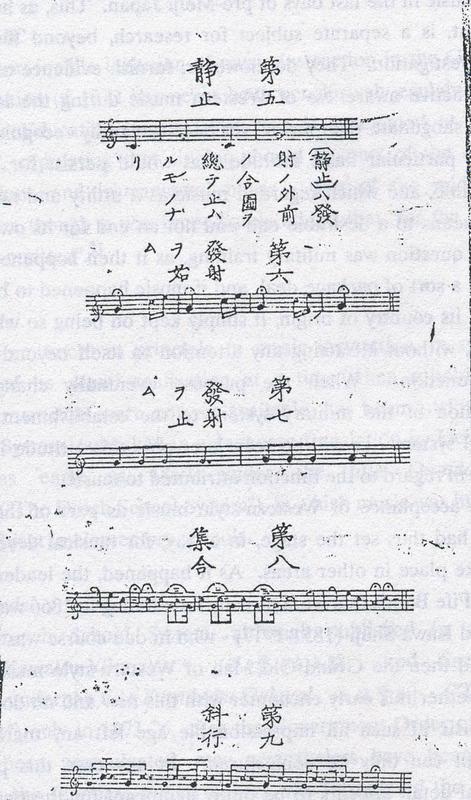 The early history of Western military music in Japan and the illustrations from Japanese drum manuals are taken from a book by Ury Eppstein, The Beginnings of Western Music in Meiji Era Japan, The Edwin Mellon Press, Queenston, Ontario, Canada, and used by the kind permission of the author. 4. Appèl in modern Dutch means an urgent request, a visible display or calling out of names. I have as yet to find a contemporary Dutch military translation for this and other Duty terms listed below. Jan Pustjens, Principal percussionist of the Concertgebouworkest, could not translate the text of my 1809 Dutch drum manual because the Dutch, in his words, “was too old”. 5. Also published in 1856, but without a publication date, was Seyiō kogun kofu ( “Western Military March Drum Score”) a book of Fife and Drum music scored for Transverse flute, small and large drum. Thus it’s not clear which book came first. 8. The information on post-Meiji era Japan, is taken from The Music of Toru Takemitsu; Peter Burt. Cambridge University Press, 2001; chapter One. 9. “Sonata for Violin”, 1897. Koda studied briefly with Luther Mason. 10. 1948 was the year of Toru Takemitsu’s first known, un-published work, Kakehi (Conduit), for piano solo. Dienst mars (narch) Drum notation-published,1856. Japanese trumpet signals for troop motions, “Eikoku hohei renpo”: 1865. 1774-1st Japanese Treatise on Western Anatomy. Over Het Tromslaan, Dutch, Amsterdam-1809. collection, R.E. George l. Winters, Berlin, 1777. Auspicious Ceremony of the Russian Mission, ca.1854: Kawahara Keiga, (ca.1786-ca.1860). Courtesy, The Stuart Jackson Gallery, Toronto. Procession of Emporer Meiji Through Tokyo to Chiyoda Palace-from 12 views of Tokyo; Kuniteru II (1829-74). collection, R.E. Procession of Foreigners at Yokohama (detail),1861;Yoshikazu, (fl. ca. 1850-70). courtesy, The Stuart Jackson Gallery, Toronto. Troops on Parade, 1870: Mosai Yoshitora (c.w.1840-1870). collection, R.E..